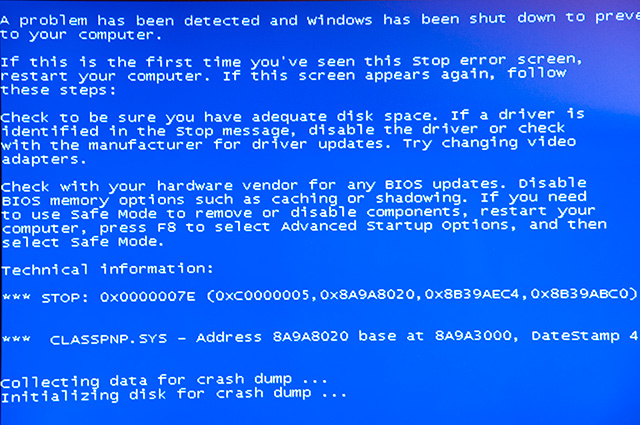 Here is a situation… You’ve installed a new Windows 7 on older laptop and on first boot it resets or shows BSOD (Blue Screen Of Death). You tested hard disk, memory, everything was OK on previous system. What can be wrong? There are many suggestions on forums about this or similar problem, with no solution. Well, here it is! I had similar problem with old Toshiba M40 laptop, which is intended to work with Windows XP, but my client tried to install Windows 7 and he couldn’t do it, so he brought it to my repair shop. Laptop passed all major tests (RAM, HDD, CPU), but it could not pass the first boot. I had to pull out client’s hard disk, put it on other laptop and install system without any drivers. After placing HDD back to client’s laptop, first boot of Windows 7 (32 bit) was OK. I was waiting until it installed all drivers, and then tried to reboot. It could not boot Windows even in Safe mode. So, I had to load “Last known good configuration” and after loading system, I disabled all suspecting drivers (network, display, USB, audio, cardbus, camera, wifi, mass storage, but not hard disk controller because this is mandatory driver. Next boot was OK, so I had to find which driver is making problems. It is very important to make System restore point when everything is OK, so you can revert changes if needed. After making restore point I’ve had enabled one driver and rebooted, repeated this until system could not boot. In my case, there was problem with Texas Instruments CardBus adapter. In your case it could be some other driver that makes problem, so this is a procedure you should follow until you find unsupported driver that makes classpnp.sys blue screen of death. Posted on October 28, 2017, in Laptops, Software and tagged classpnp.sys, classpnp.sys bsod, toshiba m40 can not boot, toshiba m40 windows 7. Bookmark the permalink. Leave a comment.